A quick note: I realize that I had planned the first entry for the poem “Dum Diane vitrea” this past Tuesday. However, since I was quite distracted by travelling to Toronto for a Peter Gabriel concert by way of Guelph, that entry was not published. Watch for it next week, and my apologies for missing a beat. I’ve got my rhtyhm back now, though. Beowulf gives thanks for his seeing the dragon’s treasure, and gives Wiglaf instructions for his funerary arrangements. such for my people before my day of death. need of my people; for I may not be here longer. The most prominent feature of this week’s passage is the awkward opening sentence. Yet, and this is where I exert a bit of extra pressure on the text, I’ve translated the second line as a reference to the jewels and the like being the words of god. The reason for taking this route with the translation is simple: it gives the reader the opportunity to interpret the dragon’s hoard as the words of god, as some sort of cosmological truth as spoken directly by the creator of those cosmos. Opening up this possibility forces readers to take another look at the dragon, too. It’s still antagonistic in that it’s keeping the words of god to itself and needs to be killed for them to be distributed, but then just what kind of entity is it? It might stretching things to the breaking point, but it seems that the dragon could be interpreted as the powerful priesthood or any entrenched exclusionary religious group, and Beowulf could then be considered some kind of scholar, wrenching the truth from those who are in places of religious power and being ready to redistribute it. Though, as we find out later in the poem, this doesn’t happen since the treasure is buried with Beowulf since the Geats consider it too dangerous to add massive wealth to their leader-less state. In this reading of the hoard as cosmological truth, we need to consider what it means for Beowulf to die for it. One possibility is that in taking on such a major source of authority he destroys all of his own credibility, and as a result the truth that he uncovers can’t be successfully transmitted since without credibility (or in more contemporary terms, authority or auctoritas) no one will willingly accept what he has to say. That brings us around the matters of the theif and of Wiglaf. 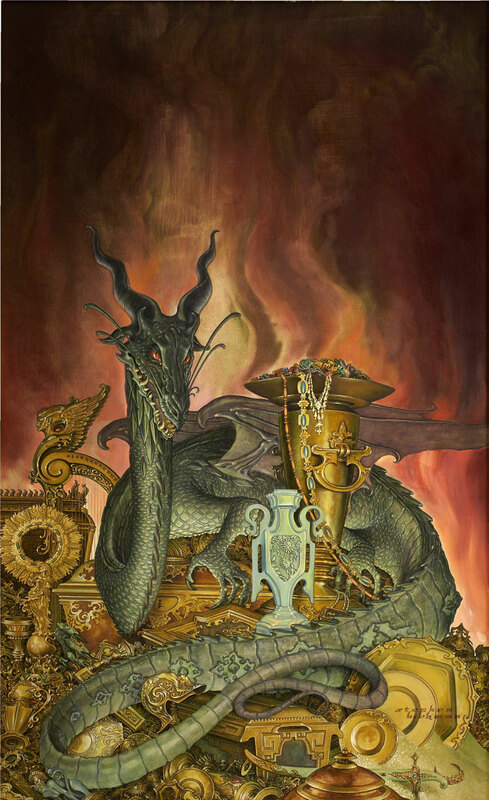 In this interpretation of the dragon’s hoard as some sort of great truth, the theif could well be one who haplessly leaked one of its aspects and therefore set the whole of Beowulf’s kingdom astir. A little bit of knowledge can be much more dangerous than a lot, after all. As per Wiglaf, he could be an acolyte of the elder scholar Beowulf. He could be a youth who has joined his cause when noone else was brave enough to, and who cared enough for the tradition of truth than the institution which had grown up and kept it from the masses. The last question that this interpretation needs to face is whether or not it could have been knowingly injected into a poem written down by people working for the medieval church, an institution that was rarely free from accusations of withholding knowledge or working contrarily to the truth of things. Representing the church as a dragon, something commonly equated with the devil, could be risky in a medieval context, but I argue that this interpretation of the dragon’s hoard would hold up since the dragon could be explained as a symbol only for the corrupt within the Church and not necessarily the Church itself. So, do you think that this interpretation holds water, or am I just stretching my own credibility by trying to keep my translation as literal as I can? Or, for that matter, have I missed something in my translation? Let me know in the comments! Next week, the full complement of a Latin and Old English entry will return, with the first verse of “Dum Diane vitrea” and Beowulf’s further final words to Wiglaf. This entry was posted in Beowulf, poetry, translation and tagged close reading, dragon, Old English, speculation, treasure, Wiglaf by NSCZach. Bookmark the permalink.